Hello Bro. Drew, I received The Man Who Would Be King jewel the other day and the comments, both from my Masonic Brothers and others has been much more than excellent. The look and weight of the jewel and the fabulous cut of the chain is what I have come to expect from The Master's Jewel studio. Thank you for using your 'working tools' to create such a nice and enjoyable piece. Received my "man who would be king" today and could not be happier. It is beautiful and I will wear it everyday. Thank you Drew for such fantastic workmanship. 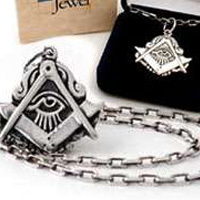 I will be back and will recommend you and the Master's Jewel to any brother who wants high quality masonic jewelry. Thanks! I just love it! I received my" Man who would be King" necklace just last week, and I just want to say how impressed I am by the skill of Brother Drew. The necklace met all of my expectations and them some. I have been fascinated by this piece of jewelry from the first time I viewed the movie in 1977. I have always wished to have one, and thanks to this most talented Brother a dream has come true. Thanks again for a job well done!!! I received it two months ago and I have to say that every day I like it more. Cheers from Spain! A stunning example of the craftsmanship of Bro. Horn. My "Kipling's " Jewel was purchased in conjuction with a Signet Ring in Silver, but alas, I must wait until 12/25 to wear it, as it is now wrapped up and under the Christmas tree! Currently 48 guest(s) and 0 member(s) online.